Select the individual items you require from the drop down boxes above to mix and match your own 2 piece. 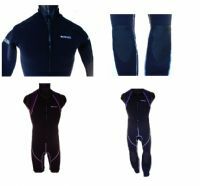 Wearing this style of wetsuit the user can accommodate varying weather/water conditions and also enjoy greater flexibility as and when required foor sports that require greater upper body flexibility, for example sailing or kayaking. Also available are 2 piece suits to suit Ladies. Our Blue Rush wetsuits use a combination of 1/2 mesh and double lined high quality titanium neoprene with a fine quality nylon on the double lined finish. The 1/2 mesh is on the front panel and back kidney panels, for added warmth. All our wetsuits feature Y.K.K. zips which are situated up the front of the wetsuts and jacket.